Preface Over the period of time the CSIR-UGC-NET/SET (JRF & LS) examination has become more challenging due to increasing number of students and new questions pattern. Though every candidate has the ability to succeed but in a competitive environment in-depth knowledge and good source of study material is required to achieve high level goals. 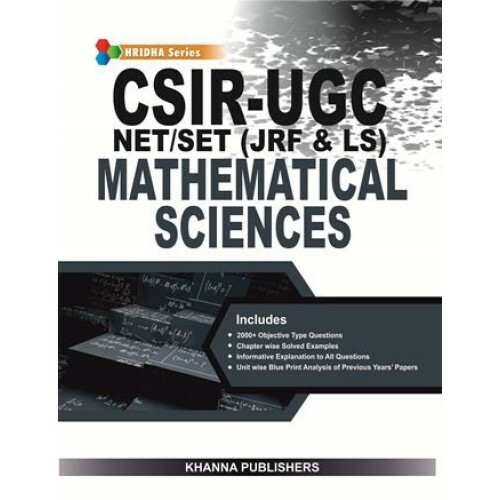 The first edition of the book Mathematical Sciences has been updated according to the latest pattern of CSIR-UGC-NET/SET ( JRF & LS ) examinations. The whole book has been divided into Topic-wise with Solved Examples and Multiple Choice Questions ( MCQs). We have true desire to serve students by way of providing good sources of study materials. I hope this book are most welcome. Inspite of our best support, it is possible that some errors might have crept in. We shall acknowledge with gratitude, if any such error is brought in our notice. Also, any suggestions and comments from students and teachers for improvement of the book are welcome. We hope the book will be found useful by the students.